The Hall has a total capacity of 100 people, seated. The chairs are lightweight, and there is a number of large folding refectory or craft tables, and smaller square café style tables. There is gas fired heating suitable for the groups who use it for sedentary activities such as art, reading and community meetings, as well as providing a warm space for movement and dance sessions. It has good lighting (fluorescent tubes) and two ceiling fans. 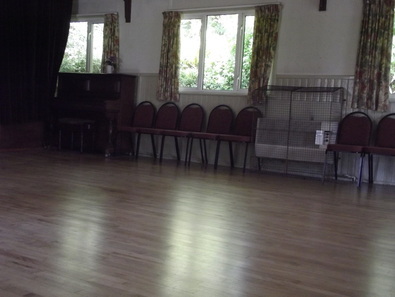 We are especially proud of our polished, ballroom-standard dance floor, and the hall is used for all sorts of dancing classes, lessons and groups. There is a raised stage, with stepped access. At the moment the stage is not curtained. ​We have installed a basic PA system and speakers, thanks to funding from Patcham Community Association. This is hireable, at extra cost depending on your requirements. Please talk to the Bookings Secretary about this. We have a fully fitted kitchen, with facilities including an electric hob, a separate oven, a microwave oven and a small fridge. We also supply white china cups and saucers, teaplates and some larger dinner plates, in the hire charge. There are large catering teapots, tea trays, and two electric kettles and a hot-water urn. There is a dishwashing sink in the front kitchen, with hot water via the tap from a new under sink heater in the larger kitchen. There is an additional sink with hot water in the back 'green room'. ** You will need to supply your own cutlery, chopping boards, cooking utensils, washing up liquid and tea towels. The Hall is cleaned regularly in between hire periods, and is kept in good repair by a caretaker, with support from the committee and volunteers. It undergoes a regular health and safety risk assessment. It has first aid supplies suitable for emergency situations. The fire extinguisher equipment is checked by the Fire Brigade annually. There are two toilets, one with a disabled facility and baby-changing table. Both have handsinks, and soap and paper towels are supplied. There is also a portable ramp for wheelchairs to use the front door and a new ramp with assisted access to the back door. The Hall cannot supply wifi or a telephone, nor specialist stage lighting or gantries for such, nor storage facilities for short-term hire. All electrical equipment you might want to bring onto the premises has, by law, to be PAT tested and certificated, and the hire contract asks you to confirm this. so please contact the Booking Secretary for prices to suit your requirements. Fees must be paid in advance on a monthly, termly, quarterly, or annual basis. A returnable deposit is added to all one-off bookings. For groups, a Regular Keyholder deposit costs £10. Please note the Hall has a maximum Fire-Risk licensed seated capacity of 100 people. It cannot be booked for Discos or events with a loud sound system. Dancing shoes with stiletto heels are not allowed on the floor, nor should you use dance chalk/talc as it can render the floor dangerously slippery. There is no smoking allowed in the wooden Hall or its immediate vicinity and grounds. Apart from unloading, the driveway must not be used for parking cars, as this contravenes the Fire Regulations. You will be issued with a Contract for the hire period, and you must pay for the hire of the Hall before we let you have a key. Once we know you have paid, we will make arrangements for you to collect a key from a local Committee member. The Deposit is an insurance for us against breakages and damage. It must be made as a separate payment along with the payment for the hire period. For one-off events, the Deposit is returnable in full within two weeks of your event, unless there is damage to the Hall, or additional cleaning or floor polishing requirements, or any other inconvenience to the Caretaker and the Committee. If this happens, we will be in touch to discuss the scale of the deduction.